I get asked how the 17.6 & 20 Open Bows compare. I'll try to give you an overview of the differences and similarities including some of the obvious ones. The boats are the same height & width. They use the same windshield. The 20 is 2 1/2 feet longer. The open bow on both boats is the same size. All Dyna-Ski Boats have a tracking fin. The 17.6 is like a sports car with a 150. The 20' is OK for sking with a 150 but hardly a sports car. I suggest at least a 175 on a 20' and a 200 HO or larger is much better it seems. The 150 HO isn't any faster than the regular 150 on a Dyna-Ski boat. 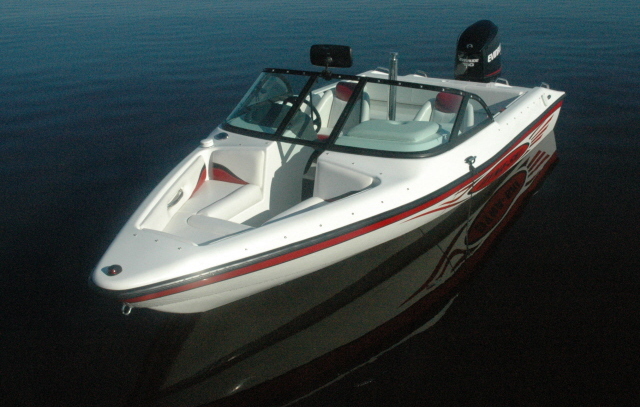 The 17.6 Open Bow with a 150 and a water ski prop will run around 50 mph on the GPS. 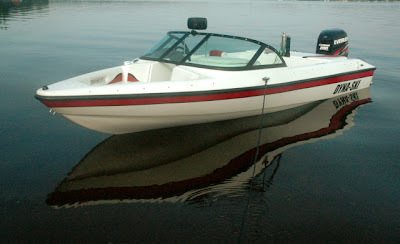 A 20' with a 200 HO and a water ski prop will run around 54 mph on the GPS. A 250 HO is only a few miles per hour faster. The 17.6 is rated for a maximum of 150 hp by the US Coast Guard. The 17.6 makes a good ski boat with a 115 two stroke. I've personally pulled 2 barefooters with three adults and one child in the boat and pulled 4 footers behind a 17.6 with a 150 with a little more power on tap. I've pulled a 185 lb barefooter behind a 17.6 with a 90 hp two stroke with 2 adults and one child in the boat. I was surprised by how good of water ski boat the 17.6 with a 90 was. I suspect that a Dyna-Ski 17.6 with a 75 would be a good ski boat but I'm thinking pulling a barefoot skier might not be possible. I have the testing information that I'd be glad to share with you if you email me at info@dyna-ski.com and ask for it. The thing that amazed me was how little gas and oil the 90 & 115 used while testing the combinations even compared to a 150. The 20' will pull a barefooter with a 150 but I doubt it will pull 2 footers together with three adults and one child in the boat. A 200 HO on a 20' will pull 5 barefooters. Outboard motors cost more for more power. Bigger outboard engines tend to use more gasoline than smaller ones. Inboards with V-8 engines tend to use a lot more gasoline than 4 and 6 cylinder outboards for the obvious reasons. Torque is more important than horsepower on Dyna-Ski Boats. Rear seat passengers in the 17.6 effect the boat's feel more than they do in the 20' Open Bows. The nose of the 17.6 boat comes up a little more with rear seat passengers. Once on plane the 17.6 settles down just like the 20' does. If the rear seat load isn't somewhat balanced in the 17.6 the boat tends to lean slightly to the heavier side. I have not noticed either of these characteristics with the 20' Open Bow Models. 17.6 & 20' boats hold speed very well if properly set up. The most important things are motor height, prop selection and even the quality of the control cables. Little if any motor trimming is needed for any skiing other than barefooting with either length Dyna-Ski. The lighter 17.6 has a smaller wake than the 20'. The 20' has a smaller wake than the heavier typical inboard water ski boat. Our slalom wake is great for kids and women because it is smaller. Both boats respond to weighting with fat sacs just like inboards do. We designed our boats with Barefoot International or Fly High Products in mind. You can get a tower or an extended pylon for the Dyna-Ski boats. The V-Drive style of boom with a height adjuster works very well on both the 17.6 & 20 models. 17.6 requires a lower capacity boat trailer and boat lift. We normally put the boat on a 2400 lb. capacity trailer. A 2000 lb. capacity lift seems good also. The 20' boat trailer needs brakes, the 17.6 trailer does not according to the DPMV. Less garage space is needed for the shorter boat, motor and trailer. The lighter combination also tows easier. We have not built a 17.6 Closed Bow for several years for several reasons including they are little if any cheaper to build than a 17.6 Open Bow. The 17.6 closed bow has less interior space. Women like open bows. You can just leave the snap on bow cover on the boat if you like the look of a closed bow. We have even made white snap on bow covers for customers that wanted the closed bow look from a distance. Hopefully this information will help you make a Dyna-Ski your next water ski boat. You have to look hard to notice the difference from the front. The 20' Open Bow has a sun deck behind the rear seat. The 17.6 does not.